Deborah Lynn Blumberg (deborahlynnblumberg.com) is an award-winning health and wellness and business writer and editor with over 15 years’ experience writing for publications including The Wall Street Journal, the Christian Science Monitor and Barron’s. She tells the stories of the people and companies that are changing our world for the better, and has a special interest in integrative and functional medicine. 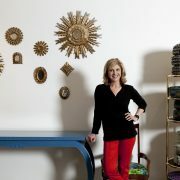 Lynn Goode began thinking differently about interior design after she was diagnosed with multiple sclerosis. After her own cancer treatment, Nancy Riviere started Wig Out, a non-profit dedicated to getting free wigs to women who want one.